The extensive range of activities on offer at Protea Hotel The Ranch caters to all tastes. Sun seekers can laze about on the comfortable deck chairs that look onto this Polokwane hotel's four sparkling pools, of which two are heated and one is a spa pool. Just next to the pool area is a well-equipped gymnasium and steam room for travellers who like to keep active. Nature lovers will be delighted at the bird watching prospects that abound on the hotel premises. Horse riding at The Ranch is another fun activity on offer. 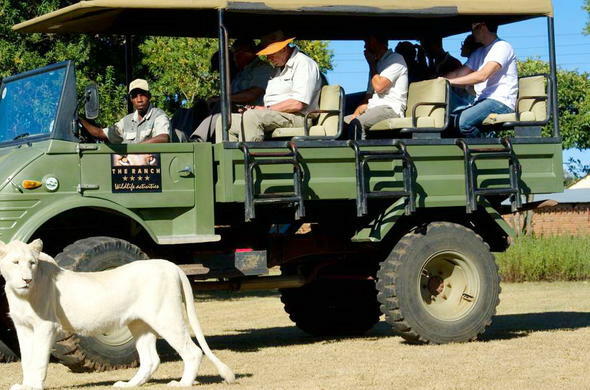 Outrides into the game park can be arranged, allowing guests to observe wild game animals from a different perspective. This family-oriented hotel in Polokwane, South Africa has wonderful facilities for children as well, providing children with hours of fun-filled activities. There is a playroom with video games, pinball machines, a table tennis table and pool tables. Additionally, there is a massive trampoline and regular games are organised by hotel staff. For a superb dining experience, guests can make their way to any of the two hotel restaurants – The Buttery or Basil’s. Overlooking the beautifully landscaped hotel gardens, The Buttery is open from as early as 6:30am and serves a tasty breakfast and light meals throughout the day. Basil’s overlooks the wooden deck and pool area. This sophisticated restaurant provides an intimate, romantic setting with its tasteful decor. The gastronomic menu is prepared by the private hotel Chef de Cuisine. For any Polokwane conference, wedding, seminar, team building event or exhibition, Protea Hotel The Ranch provides some of the best conference and banqueting facilities in South Africa. Offering 9 individually themed conference venues, of which the largest can accommodate up to 550 people, there is no event too big or small for this ideal location.